Here is the murderously funny movie based on the world famous Clue board game. And now, with this special DVD version, you can see all 3 surprise endings! Was it Colonel Mustard in the study with a gun? Miss Scarlet in the billiard room with the rope? Or was it Wadsworth the butler? Meet all the notorious suspects and discover all their foul play things. You'll love their dastardly doings as the bodies and the laughs pile up before your eyes. DVD: Widescreen 1.85:1/16x9; audio English Digital Mono, French Digital Mono; subtitles none; closed-captioned; 15 chapters; rated PG; 96 min. ; $29.99; street date 6/27/00. Supplements: All Three Endings; Theatrical Trailer. I actually never saw Clue; as I recall, it received pretty poor reviews, and there was no positive word of mouth to compel me to watch it, so I never bothered. Now that it's out on DVD, however, and I'm a big-shot reviewers, I figured I'd give it a gander. Much to my surprise, the film itself actually provides a moderate amount of fun. Clue is a modest little piece that maintains a consistently - and appropriately - light tone; it never goes so far as to acknowledge its origins, but it keeps up a vaguely tongue in cheek attitude throughout the movie. That mood works well for this project, as it wouldn't have benefited from either taking itself too seriously or ranging too far to the campy side of the street. Although I don't know if I'd indeed refer to Clue as "campy", it definitely stays loose and glib, and the actors provide wonderfully broad performances; they all know they're playing glorified cartoon characters, and they behave appropriately. The cast of Clue probably is its greatest strength, as we find a tremendously solid roster of character actors without a single leading man or lady in the mix. Actually, I suppose that once upon a time, Lesley Anne Warren (Miss Scarlet) had leading lady potential, but she never went much of anywhere and has spent most of her career in smaller parts. Of the rest of the principals, some have played lead roles but all have earned their keep through supporting parts. From Michael McKean to Martin Mull to Christopher Lloyd to Eileen Brennan to Madeline Kahn to Tim Curry - these are all actors who have great depth to their careers and who are accustomed to working in supporting roles. As such, since none of the parts in Clue are leads, this group can mesh together well and carry what otherwise might have been a weak piece. By the way, since it hasn't been all that long since Kahn's untimely death, I suppose the fashionable thing would be to make some comment about how much I miss her and how terrific she was. I won't, because that would be hypocritical; I didn't dislike Kahn but I had no particular affection for her work. However, she does offer perhaps the funniest bit in Clue, made more amusing because it's a complete throwaway move that only appears in one of the film's three endings (more about that soon). Toward the very end of the movie, Curry's butler turns off the lights before he explains the identity of the murderer. (This device was used to make the transition between the action and the different endings run smoothly.) For one of the conclusions, the butler says, "Sorry - I didn't mean to scare you", to which McKean's Mr. Green replies, "It's a bit too late for that! I hate it when he does that!" As Mrs. White, Kahn lets out this pathetic warble of a scream combined with a gasp that's spectacularly strange but amazingly funny; I almost missed it the first time and had to zip back to watch it again. As odd as it may sound, it's that kind of moment where the casting of Clue pays off. The character actors in the film are so experienced and so talented, they can take an absolutely nothing moment and make it something special. Clue itself will never be regarded as a classic, but I found it to be fairly entertaining, largely due to the efforts of the wonderful cast. Now about those different endings: in a move that added maybe seven dollars to the film's pathetic $3 million gross, the producers shot three different endings and randomly attached them to different prints. The hope was to induce repeat viewings, since people would want to see all three conclusions. Unfortunately, Clue was such a bomb that almost no one wanted to watch it end once much less sit through it two (or more) additional times. All three endings appear on this DVD, and the format allows the viewer to select how he or she would like them presented. For videotape, the studio created what they call the "trilogy ending". This attaches all three of the "solutions" to the end of the movie and runs them back-to-back-to-back. Lamely, it calls the final one "what really happened", which defeats the entire purpose of the multiple endings. The better solution features here due to the programmability of DVD. When you start Clue, you can select either the "trilogy ending" or to view one of the three at random. In my opinion, this is definitely the best way to watch the movie. If you just want to see what's in all the endings, then you should use the "trilogy", but if you want to view the movie in a more normal fashion, the random conclusion is the way to go. Although they failed to ignite the box office, I think the random endings are kind of a cool idea. However, they do make Clue more of a comedy and less of a mystery. Because each ending features a different murderer, that means the storyline has to keep things sufficiently vague. In other words, it's literally impossible to solve the mystery as you watch the film. In fact, more attentive viewers may find multiple problems with the various solutions; I'm not that attentive, but the entry for Clue on IMDB shows how many holes appear in the different conclusions. Ultimately, the film still works because of the broad and ebullient work of the actors, but I can't help but think that Clue would have been a better movie as a whole without the extra endings. Yes, they're a fun idea, but the generic sense that they forced hurts the story. The comedy is sufficient to make the film entertaining, but had the picture offered a more clear-cut mystery we could follow, it might have been a real winner. As it stands, Clue will just have to settle for being a moderately enjoyable little piece of fluff. 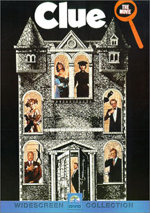 Clue appears in its original theatrical aspect ratio of approximately 1.85:1 on this single-sided, single-layered DVD; the image has been enhanced for 16X9 televisions. Although consistently watchable, the movie presents an somewhat problematic picture that generally seems decent but rarely better than that. Sharpness varies throughout the film but usually appears acceptably accurate and crisp. Quite a few scenes tend toward the soft side of the scale, however, especially as shots widen to include two or more characters; even at their most extreme, the soft segments never look radically ill-defined, but the fuzziness definitely lends a negative influence. Moir� effects and jagged edges seemed absent, and I also saw little evidence of artifacts from the anamorphic downconversion on my 4X3 TV. The print itself appeared fairly clean, with no signs of grain, scratches, nicks or hairs, although I did detect some light speckling throughout the film. Clue sticks to a pretty subdued and brownish palette, but I didn't see any blandness in the colors that didn't seem to result from the production design. While the brighter hues we view don't exactly qualify as "eye-popping", they nonetheless appear accurate and nicely-defined. Black levels seem slightly mushy but are generally dark and mildly rich, while shadow detail tends to look a little too opaque; I didn't think the shadows were ridiculously heavy, but they did obscure aspects of the image that should have been more visible. All in all, Clue seems perfectly watchable but lacks much spark in the visual domain. Less exciting is the film's monaural soundtrack. For one, I think it's pretty weak for a major studio release from 1985 to be stuck with a mono mix; Dolby Surround was very common by then, so I have no idea why this film offers only a single-channel track. That drawback may have been less problematic if the quality seemed better, but the audio sounds mediocre at best. Dialogue appears thin and reedy and occasionally betrays some slight distortion; I can't say I had trouble understanding the speech, but it didn't come across as very warm or natural. Effects displayed similar hollow and limp qualities, although I detected no distortion from them. The music was adequately smooth and melodic, though it lacked any sense of bass. The soundtrack for Clue would have been perfectly acceptable for a movie that came out in 1965, but since it appeared in 1985, that's not good enough. Clue lacks significant extras. All we find are a theatrical trailer plus the presence of all three afore-mentioned endings. A commentary would have been nice to address the challenges in adapting a boardgame to the screen, but any such insight cannot be found here. Despite that, I found Clue to offer a surprisingly entertaining diversion. The film clearly will never be regarded a classic, but the combination of a classy cast and some appropriately light direction make it a fun little romp. Unfortunately, the DVD itself is mediocre at best; both picture and sound are bland, and the disc includes virtually no supplements. Clue is delightful enough to warrant a rental, but the lackluster quality of the DVD means that I can't recommend anything more than that.